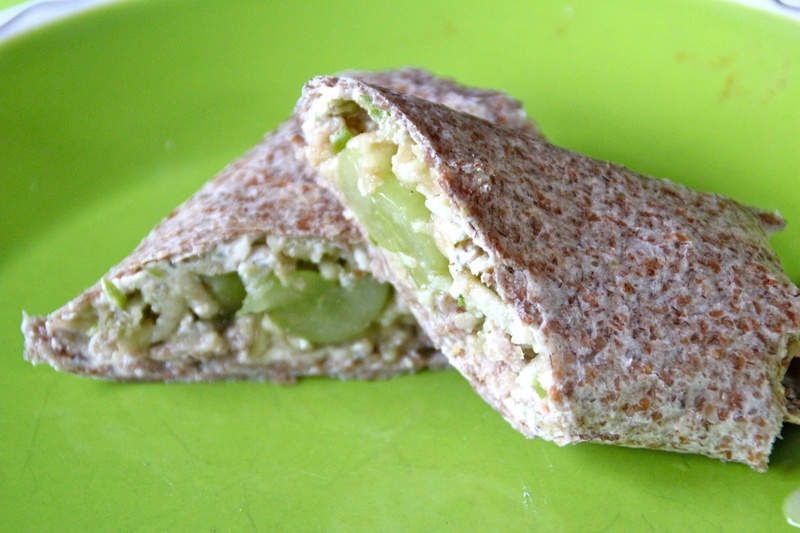 A sweet snack (or lunch). 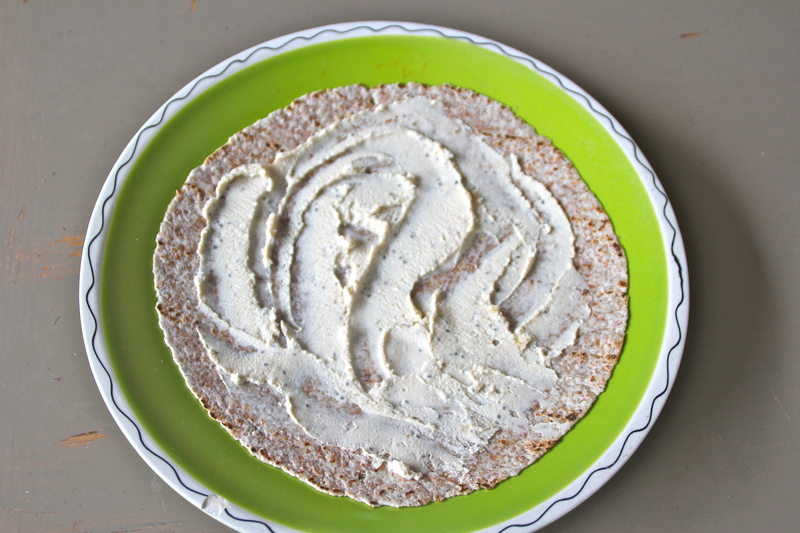 Remember my post about Ezeikel Bread? Guess what. 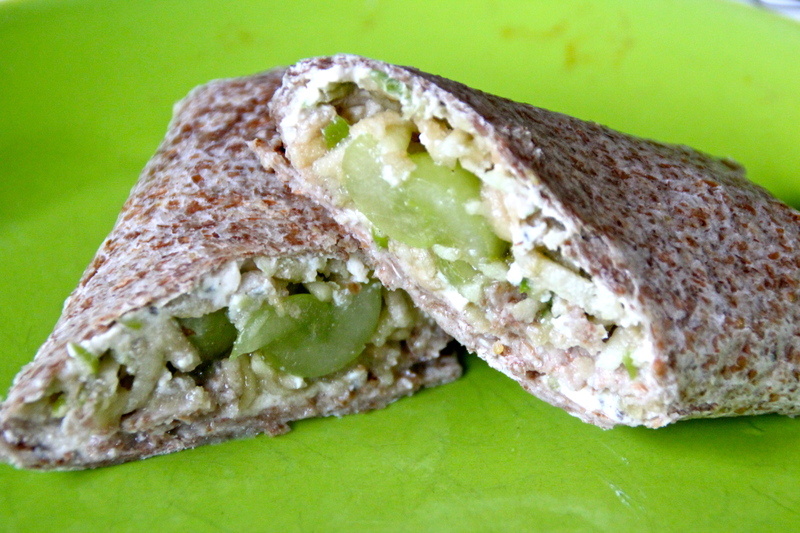 Food for Life (the Ezekiel bread people) make other stuff besides bread, like these wraps. 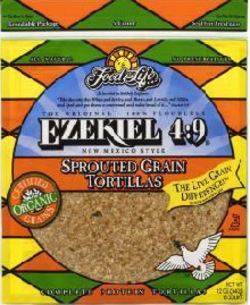 Of course you do not have to use Ezekiel Tortilla. 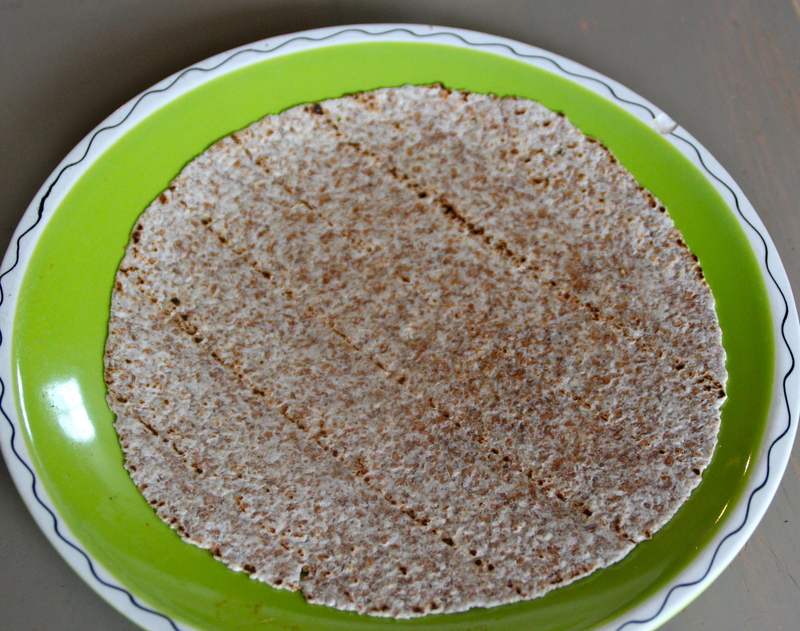 If you are just starting your health journey, start small and buy straight up whole wheat tortillas. Still be delish. :). 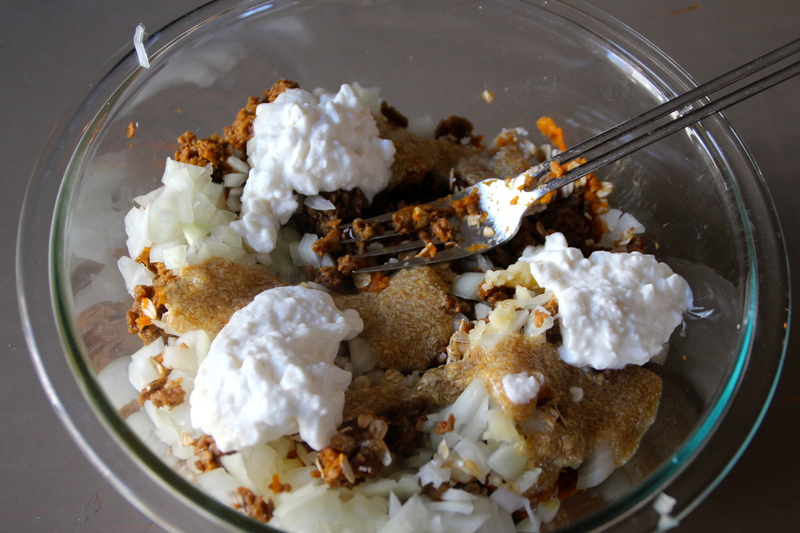 Try this yummy dessert-snack-breakfast-could be a meal recipe by following these directions. Make your spread. It’s easy, don’t sweat it. Grate your apple. Or fine chop it if you are on a time crunch. Spread your spread. Profound, I know. 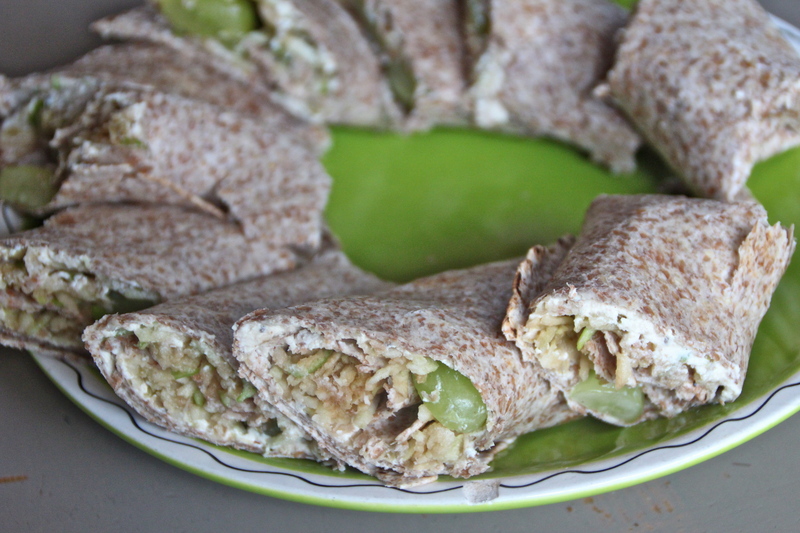 Cut and arrange in a pretty stack on a plate so people think you worked hard. 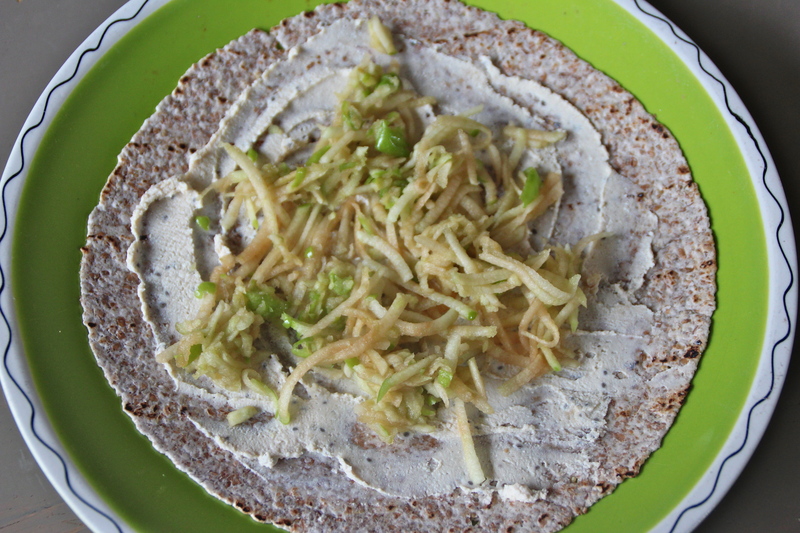 1) Spread tofu/peanut butter mixture on tortilla. 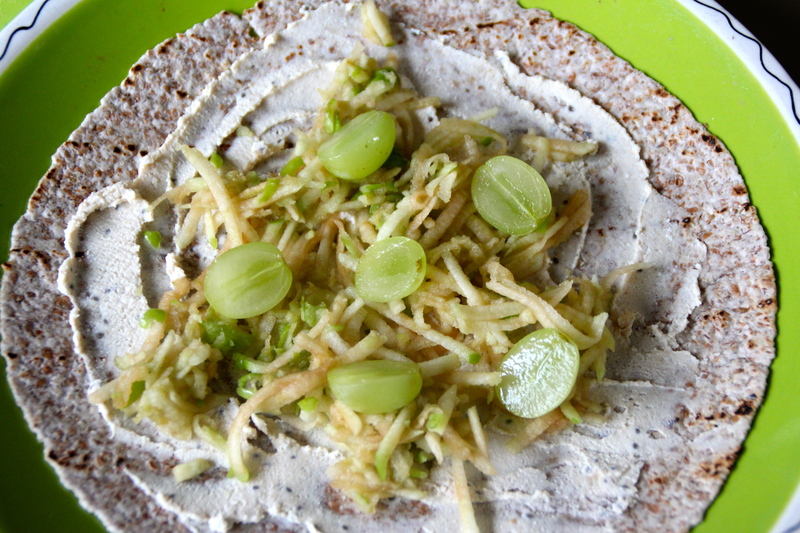 2) Place grated apple and grapes on top. 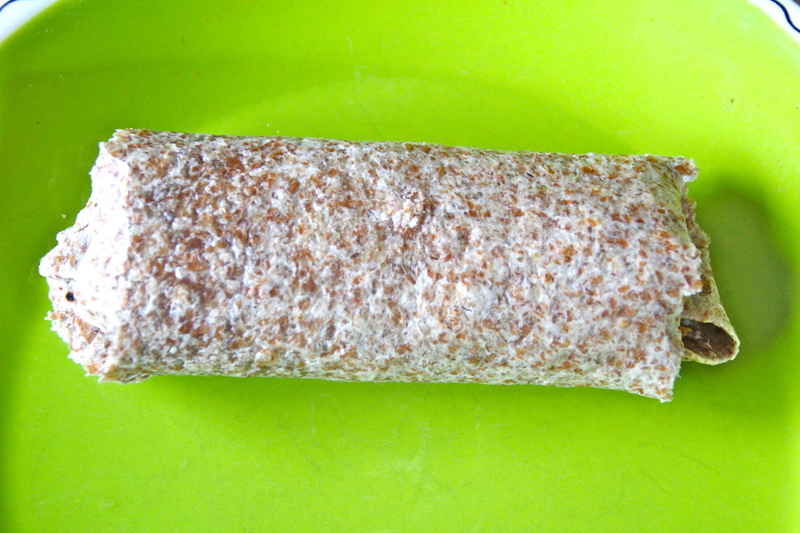 3) Roll up tortilla, folding in sides as you go. Kids can easily help with this one too. Pineapple Chicken minus the Chicken. 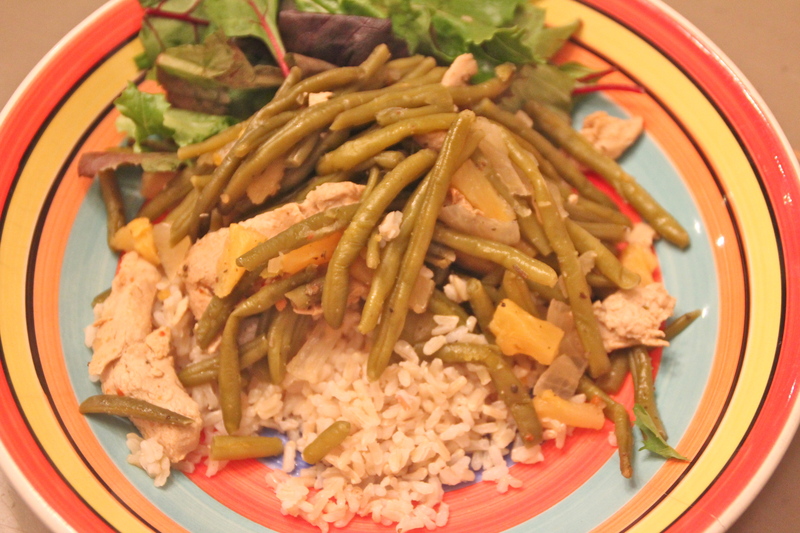 You know I am all about fast meals without too many steps or ingredients, right? Here is another one. 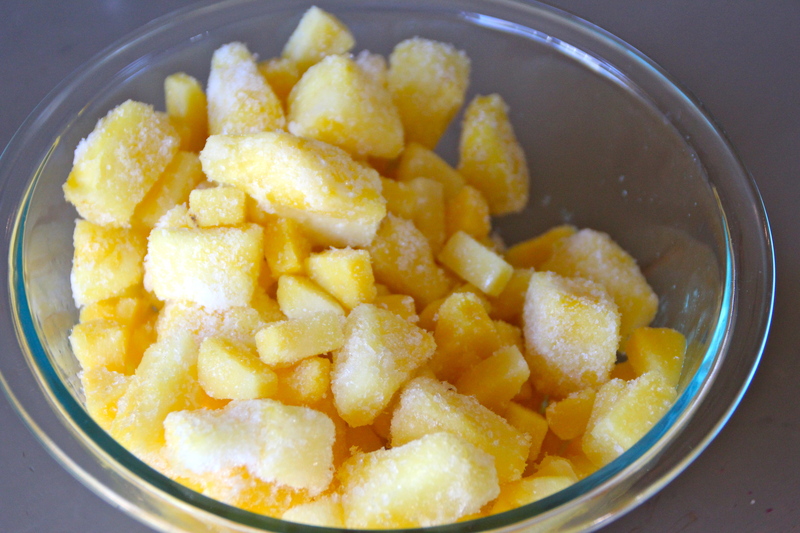 Take some frozen pineapple chunks. 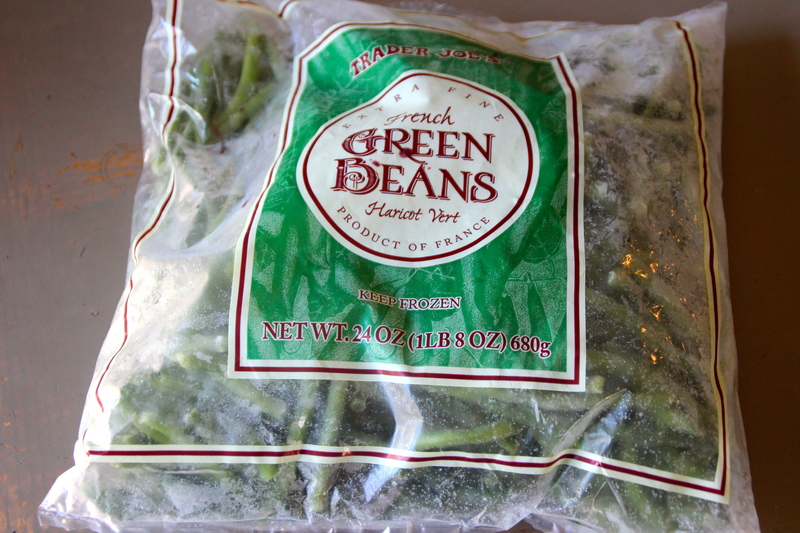 Buy some frozen green beans. 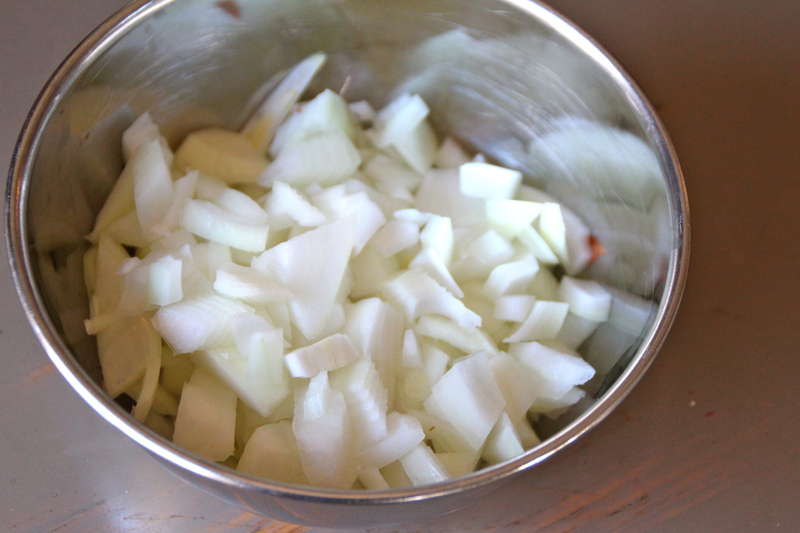 Add all three to your slow cooker. Cook for a few hours. Pile it on top. Slow cook again. 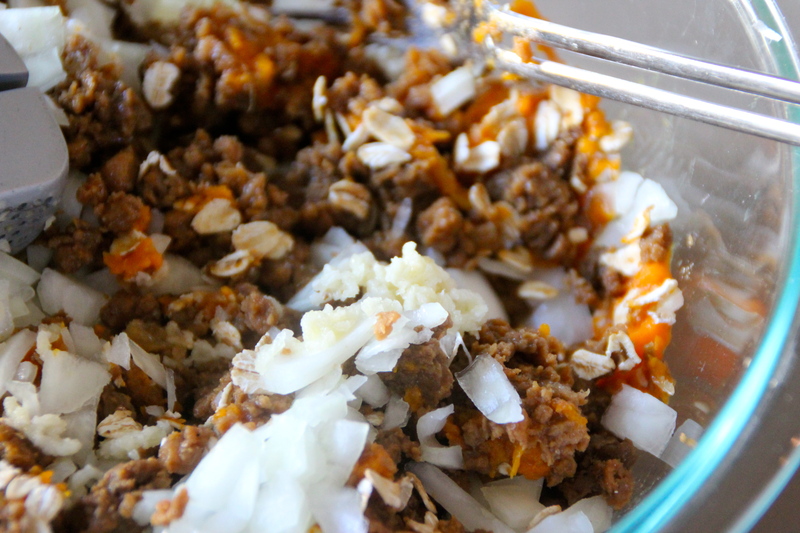 Pile it on some rice and done. 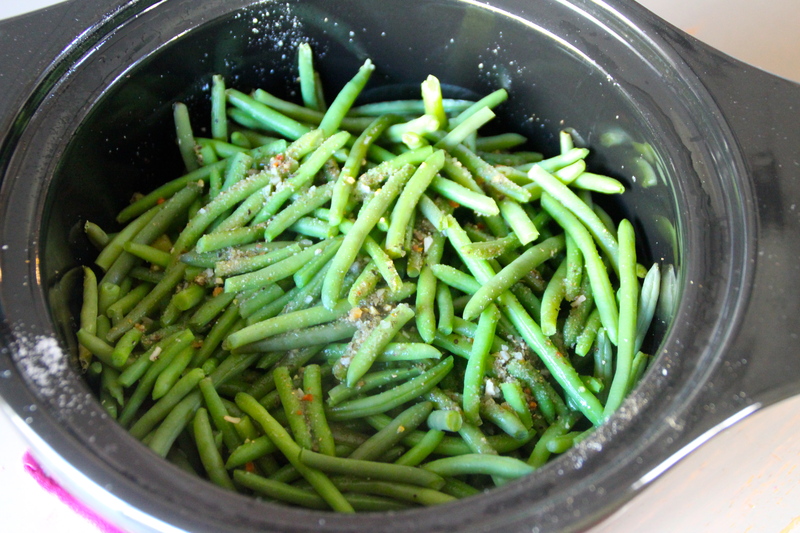 Pre-spray the slow cooker so that you have an easy clean up. Layer 1/2 the pineapple, all the onion and then top with the green beans. 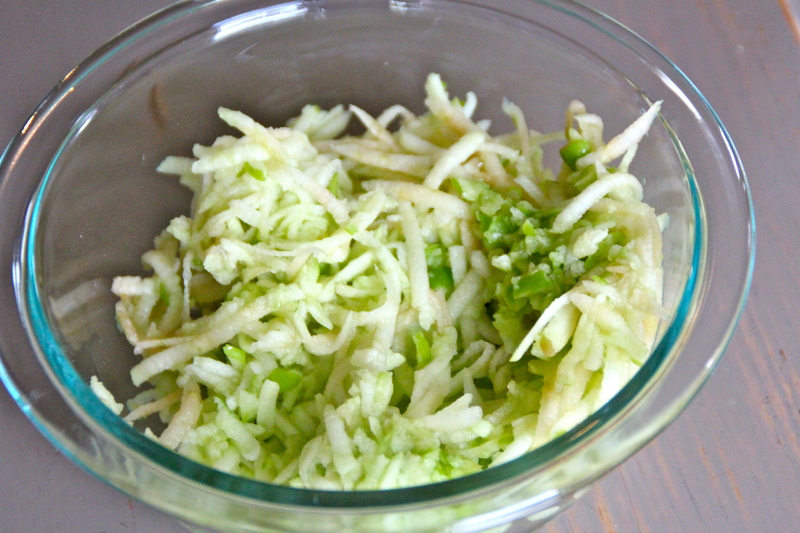 Sprinkle with 1 1/2 teaspoons seasoning and 1/2 teaspoon salt. 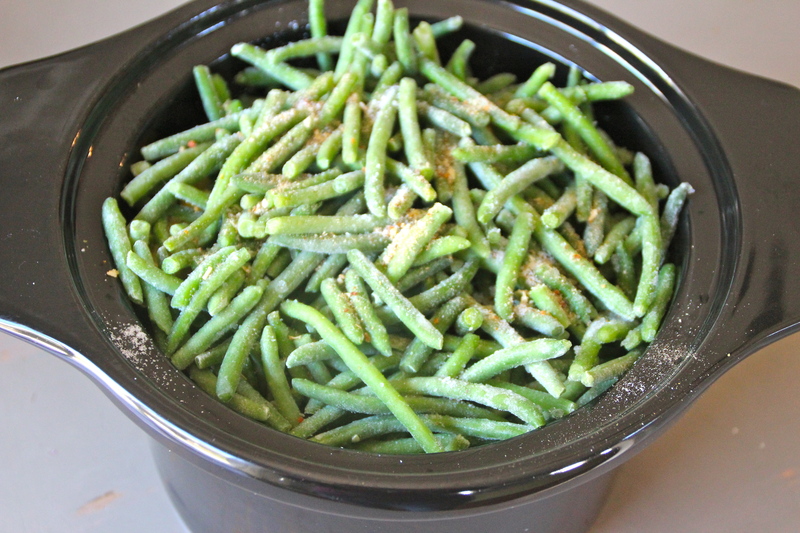 Spread the rest of the pineapple on top of this, then add grean beans and then top with the rest of the seasoning and salt. Mix contents. 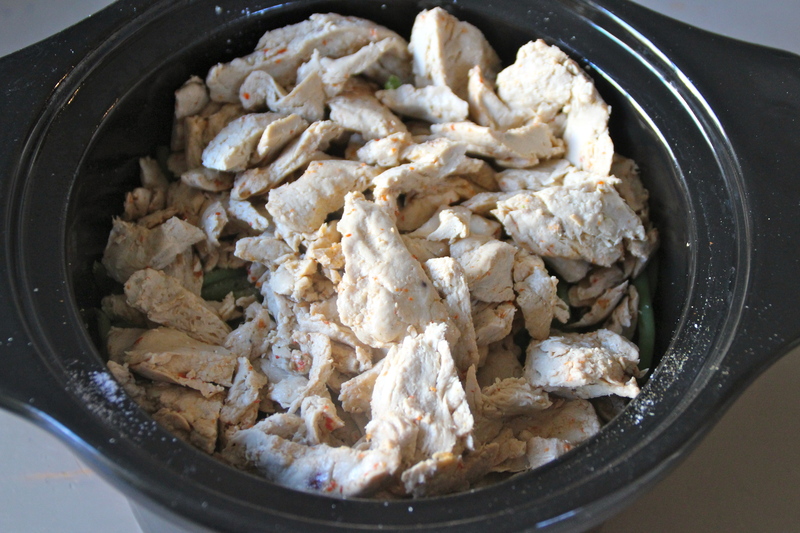 Add Chicken-Less Chicken. Cover and cook again on low for 3 to 4 hours. 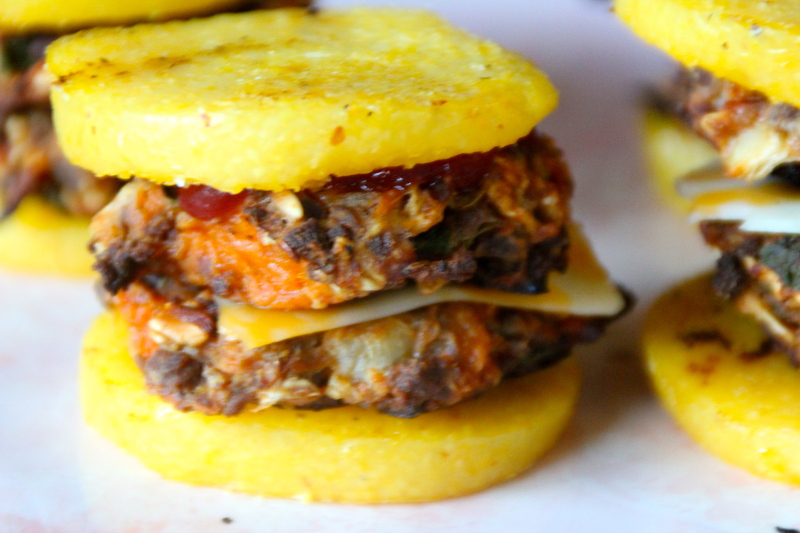 A veggie burger with a corn meal bun for a change of pace. These are slider-sized. Can you tell? 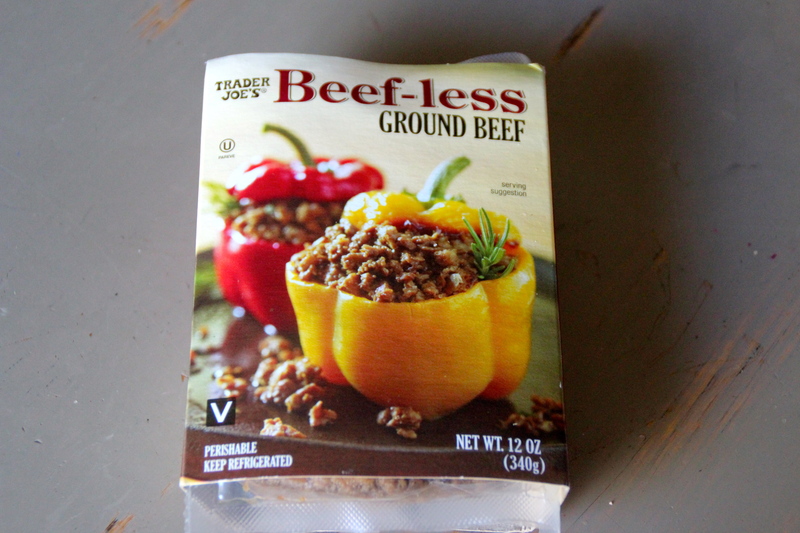 Veggie burgers can be tricky. 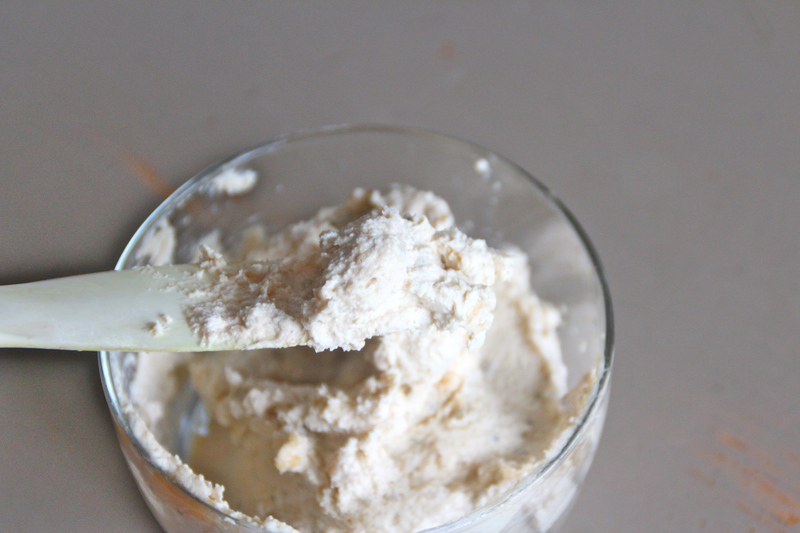 You really need to be careful with your ingredients, the wetness factor and the overall cook time otherwise you have a mess on your hands that no one will eat. I speak from experience. It all started with this. 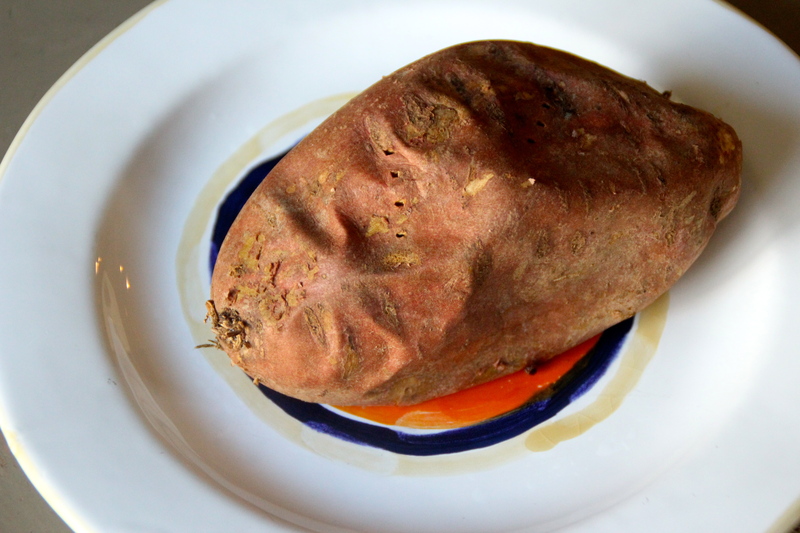 One baked sweet potato. 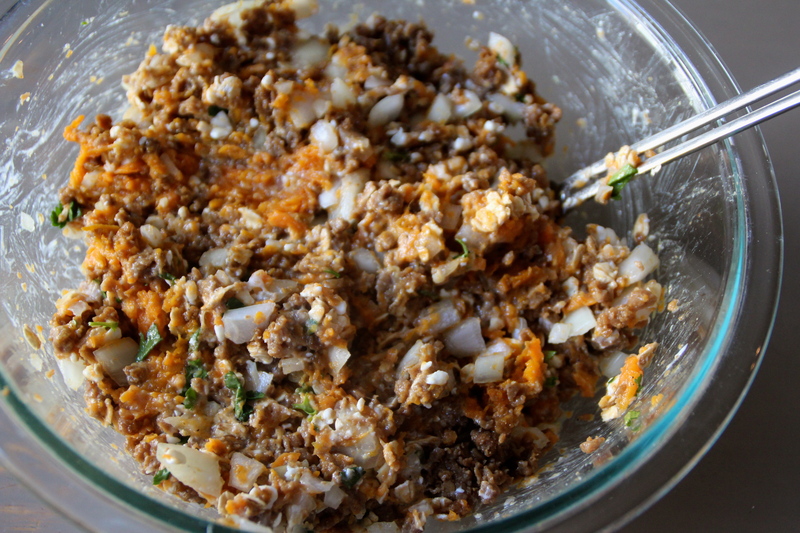 And added it to my sweet potato mash. Added some oats to help bind. 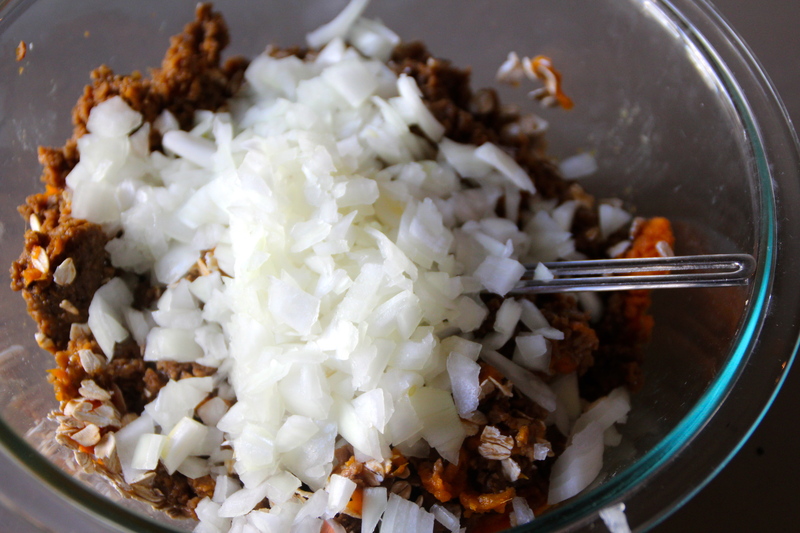 Added some chopped onion to amp up the flavor. And your egg. 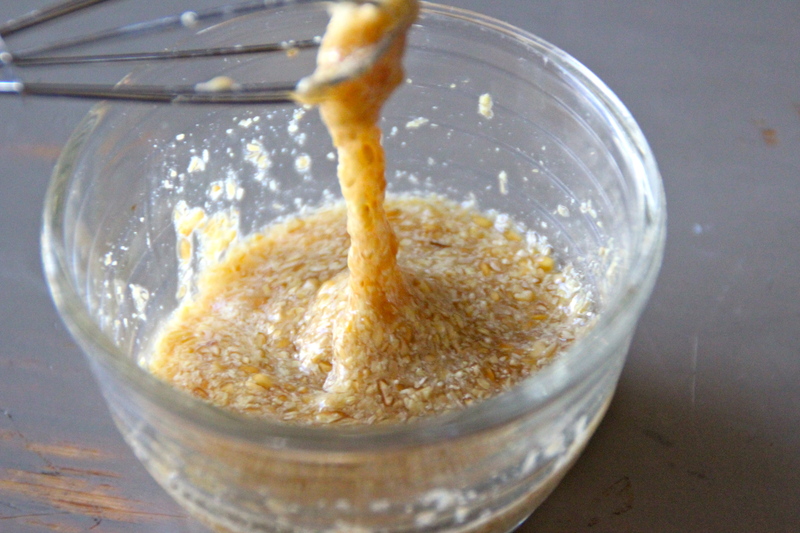 ..Have you ever made a flax egg? See how it is kind of stringy like an egg? This helps make everything stick together. Yes, it’s kind of chunky, but it works. 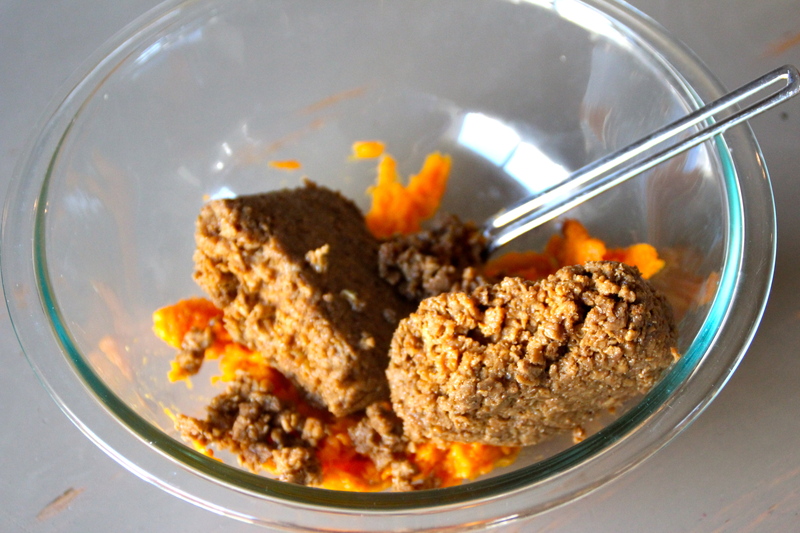 Next my “non-bread” bun inspiration. Double decker with optional cheese slice in between. Prepare a large baking sheet with non-stick spray or parchment paper. 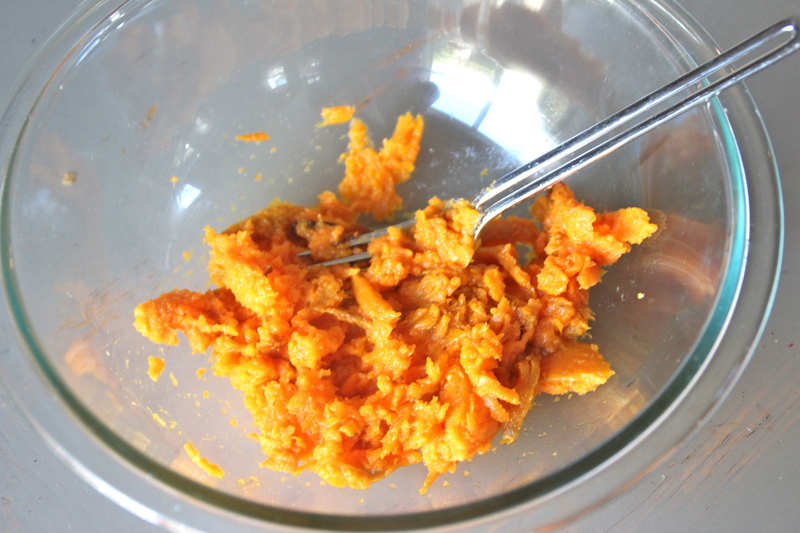 Pull skin off of cooked sweet potato mash it. 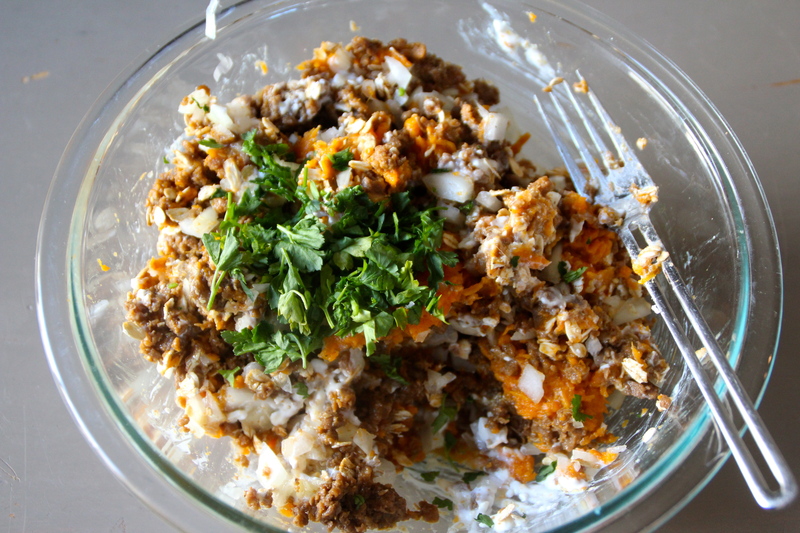 Add the beef-less crumbles, oats, onion, garlic, flax egg, cottage cheese, parsley, agave, salt, and pepper. 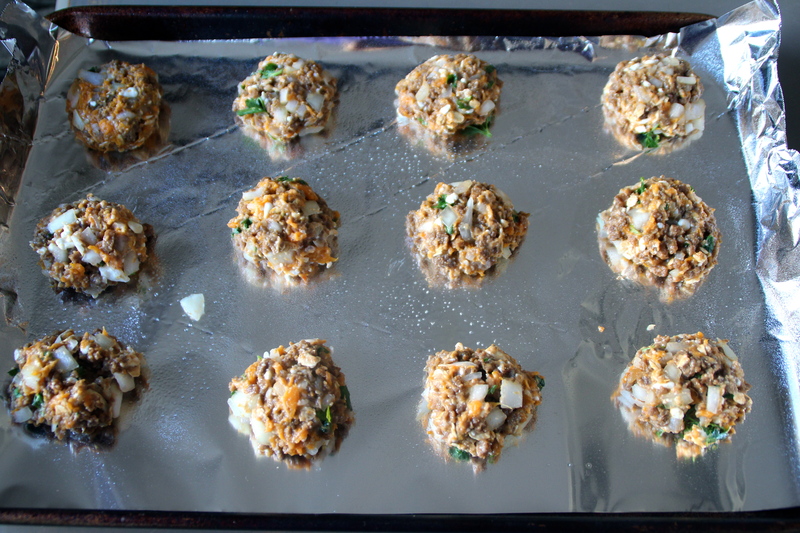 Shape the mixture into mini burger size (sliders) and place them on your prepared baking sheet. 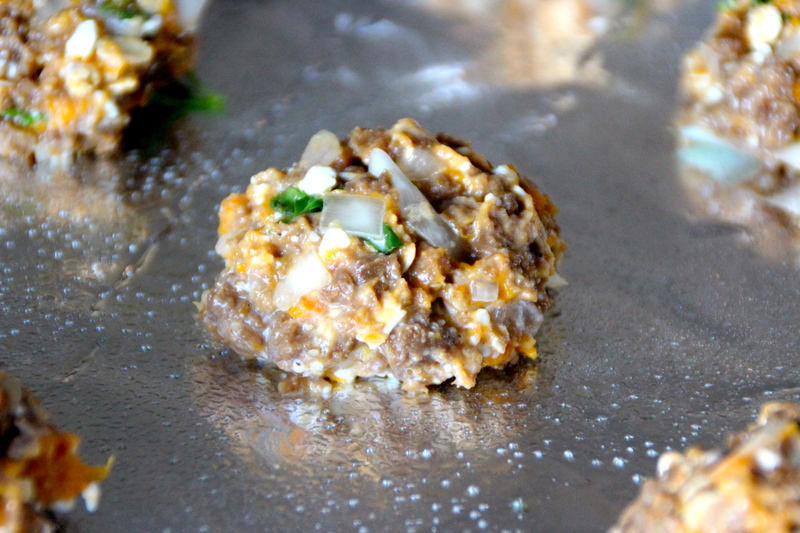 Bake the sliders for 30 minutes. Flip them. Bake for another 15-20 minutes. 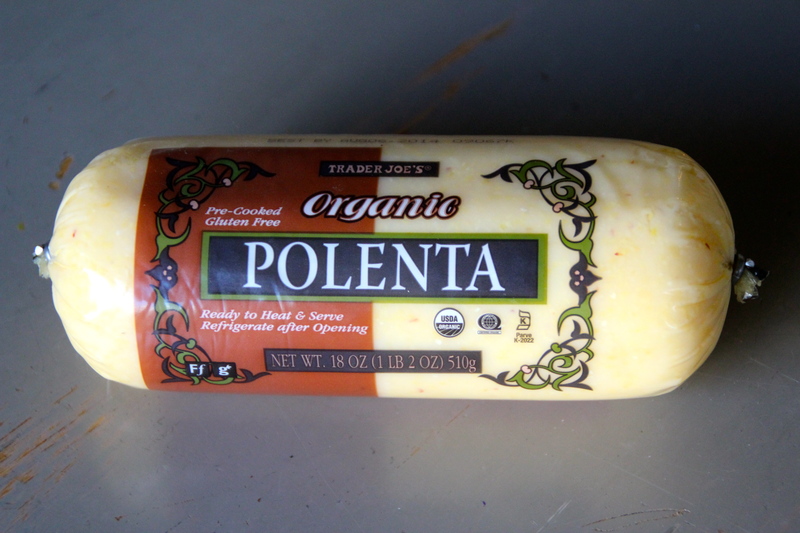 Thin slice the polenta into rounds and arrange them on a prepared baking sheet. Bake for 20 minutes, flip and bake for another 10 minutes. Could you taste the difference? 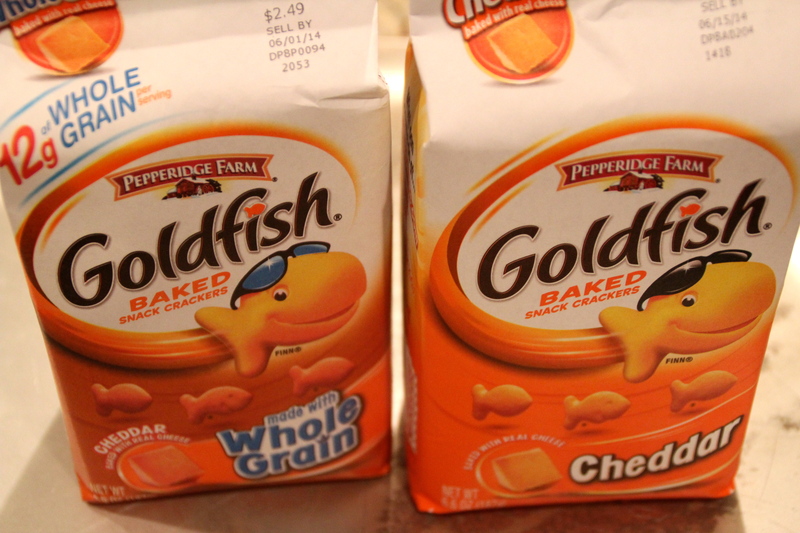 So one of the My Foodie Call kids complains because I buy the Whole Grain Goldfish. I argue with him incessantly that both Goldfish crackers really are the same. 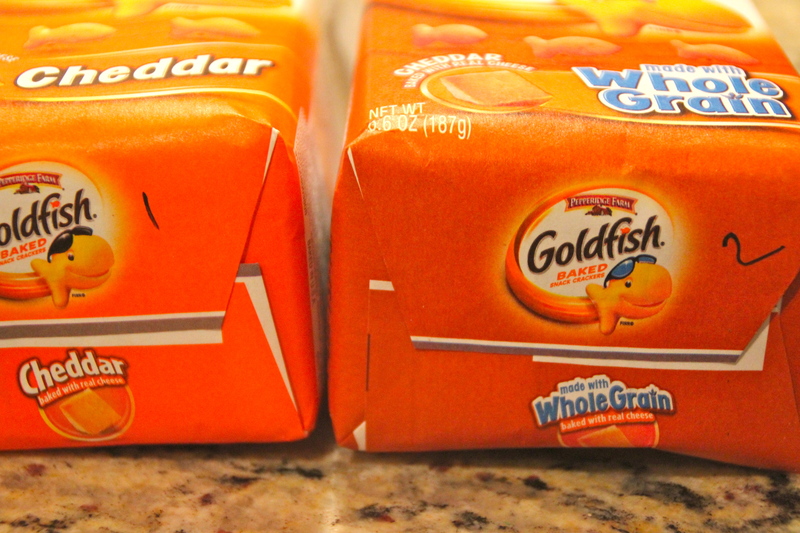 They taste the same and Whole Grain Goldfish are still plenty junky, promise. 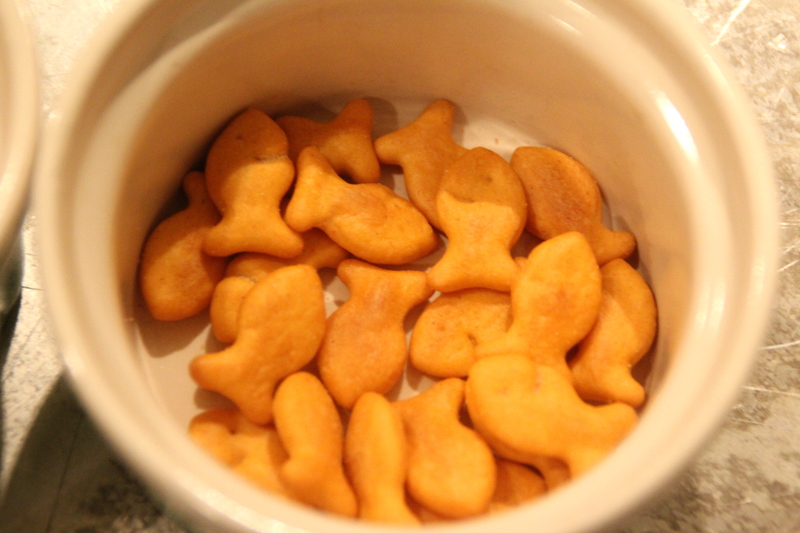 Yes, I fully acknowledge on this blog, that yes Whole Grain Goldfish are NOT good for you. Not healthy. But in this fast food world, when a mom is to conform, what is a mom to do?? Pick the lesser of two evils. and which is whole grain based on taste? Decided to stop this long-standing argument in its tracks and conduct an experiment. 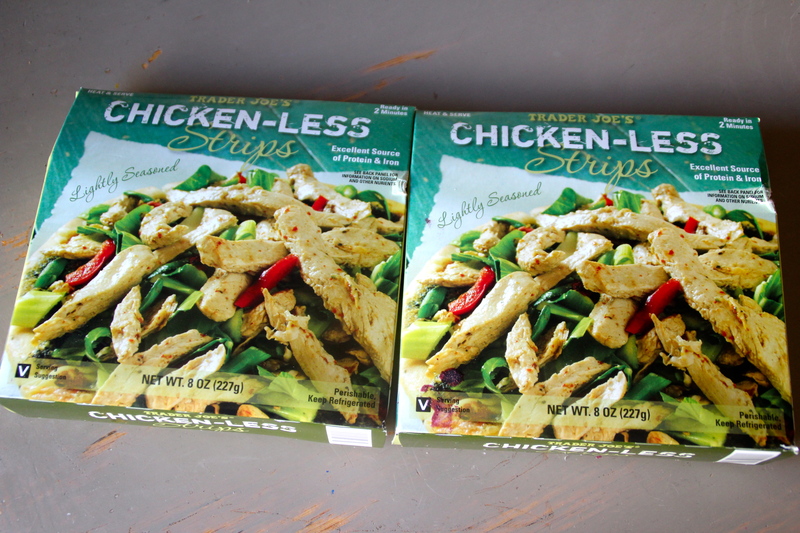 Enough of the complaining and let’s see if they really taste so different, shall we? 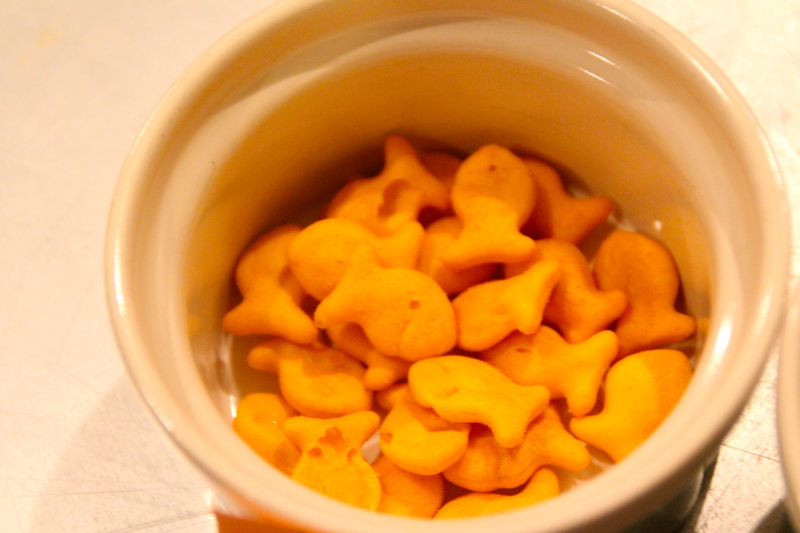 Super top-secret Goldfish cracker bowls. Mr. Foodie Call pointed out that I should not have let people see the actual crackers. True. I never said my test wasn’t flawed. After trying one from each bowl, I told them to write down which cracker is REGULAR: 1 or 2. 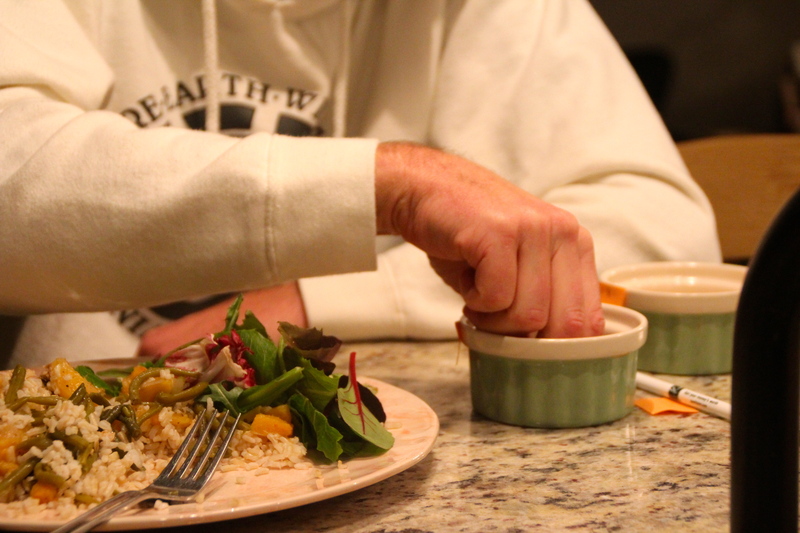 We even had a neighborhood boy over who only eats regular and swears he’ll know the difference. and he did the back and forth thing several times. Serious stuff. Remember they are supposed to write down which number they think is “regular”. 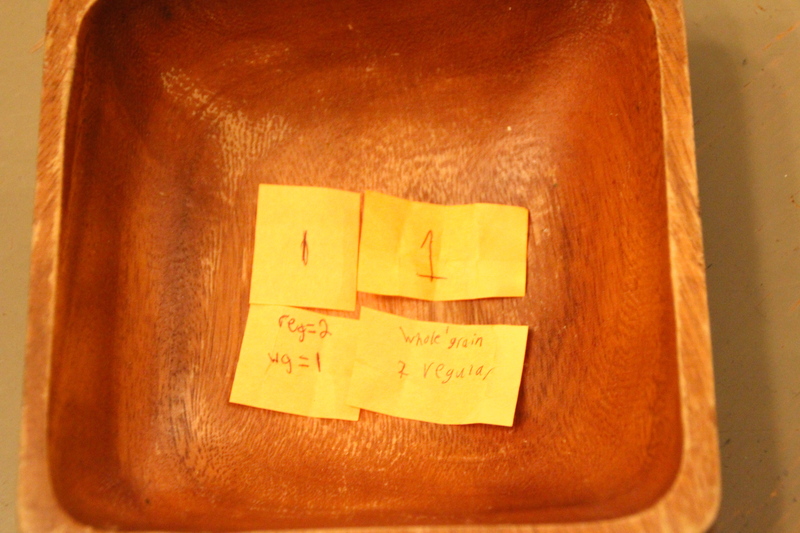 If you look closely, the top two votes are for #1 as the regular cracker and the bottom votes claim that it’s number #2. 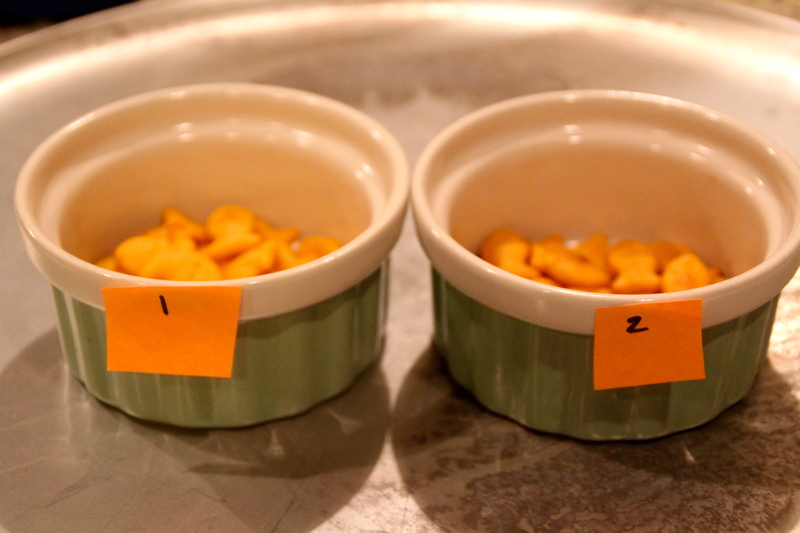 That the two boys bottom votes picked the wrong Goldfish and did not know the difference. However…there is more to this story. 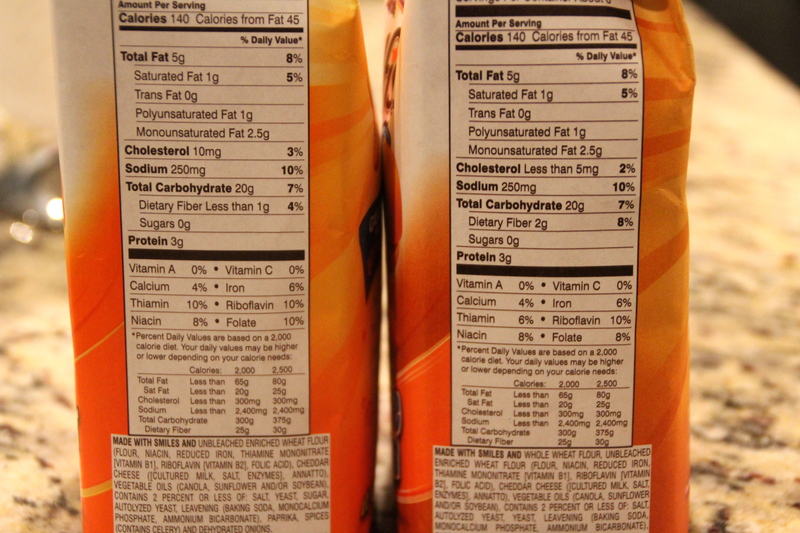 Upon closer inspection I couldn’t believe that there was pretty much zero difference in the nutritional content of the two. 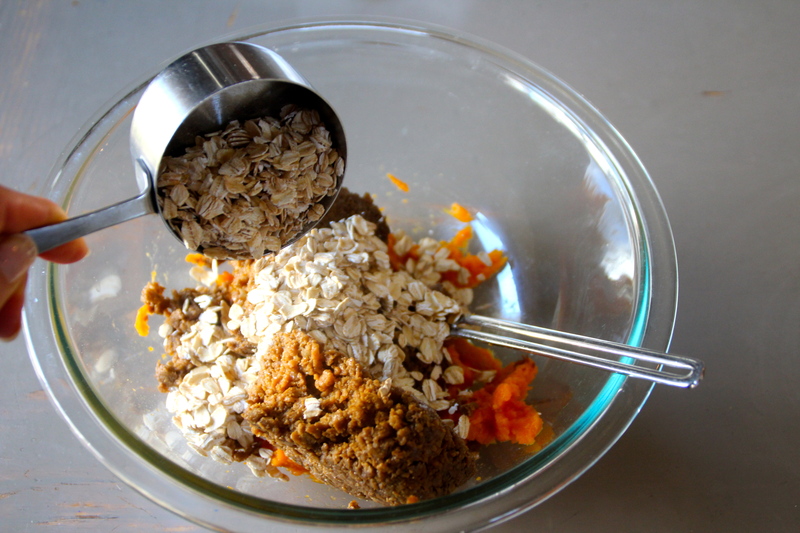 Whole grain has a tad more fiber. Hmm. Looks like I got played as well. Not caring. A little more fiber is better than nothing. Whole grain it is. So I belong to this really awesome lunch group called the Taste and See. 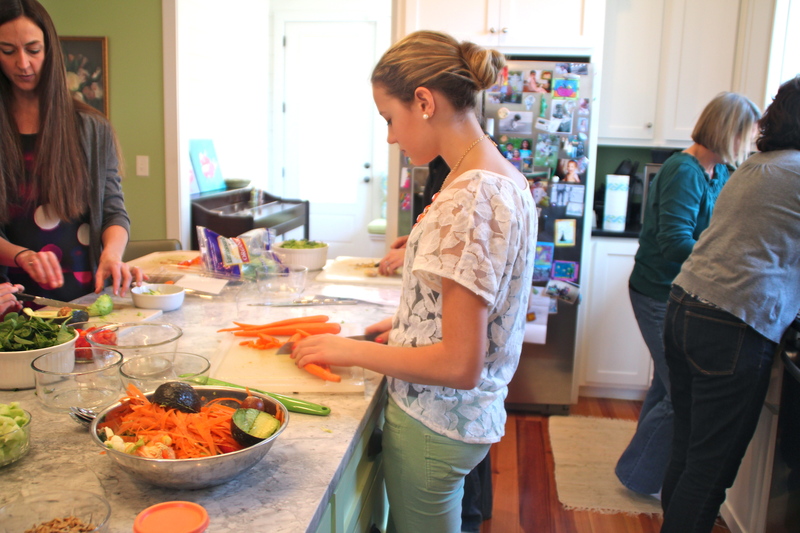 Basically the Taste and See is just a group of women that meet once a month in someone’s home to prepare and cook incredible plant-based meals. The lunches are held from 11:00 AM- 1:00 PM, and really…we just learn from each other and eat a great meal. That simple. I am not sure about you, but I eat on the go WAY too much. 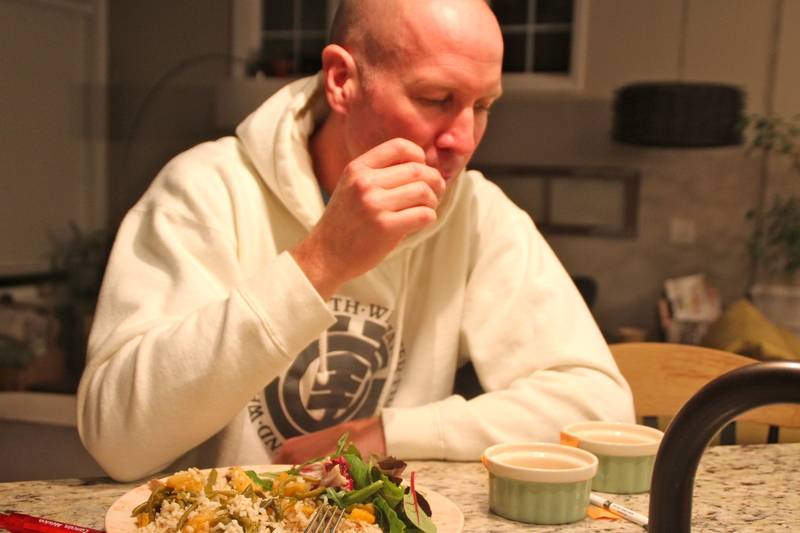 Sitting an eating a lunch with awesome people and good conversation should be a top priority. I am working on this…. Furthermore, the relationships that I have developed through the Taste and See have been so rewarding and to eat great food together? Bonus. As mentioned, this lunch group only meets once a month and we keep it simple. 11:00 AM-1:00 PM. Each menu is different, brainstormed and decided upon a few months in advance, and then ingredients are divvied up so we can shop, and then create kitchen mayhem. We cook, sit, eat, leave. Good food, good conversation. Love it. The point of today’s post? 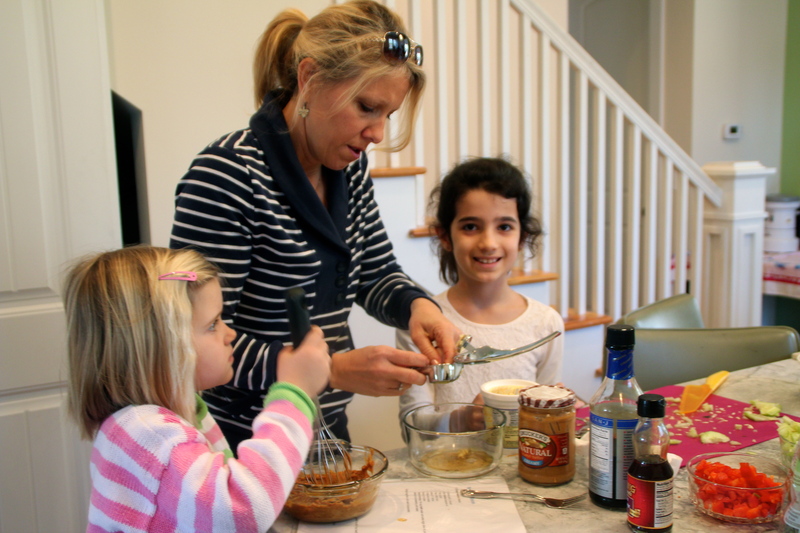 Right in line with the adult Taste and See, we felt the need to get the kids in the kitchen for their own Taste and See. Whether they want to or not. 🙂 It’s all fine if mom is eating healthy but to try to execute that on the home front? This is a whole different ballgame. Especially with the junk food forces at school and soccer shenanigans working against us. 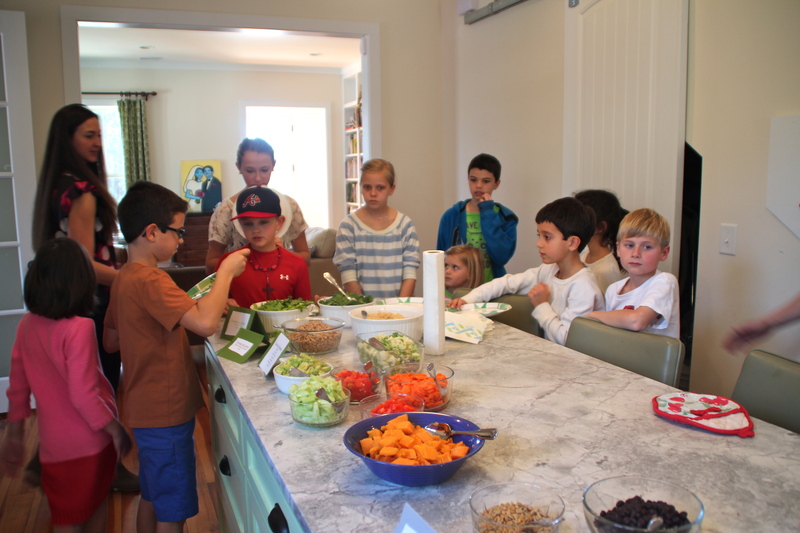 So the mission for the Kids’ Taste and See was to keep it simple, get the kids cooking, and possibly open some eyes to wholesome, plant-based foods. Alas, the Taste and See 2. Same deal, 11:00 AM-1:00PM, except not monthly…baby steps. This past Monday we had our third Taste and See 2 (woot woot), and it was fun, fast and all hands were on deck. On the menu? 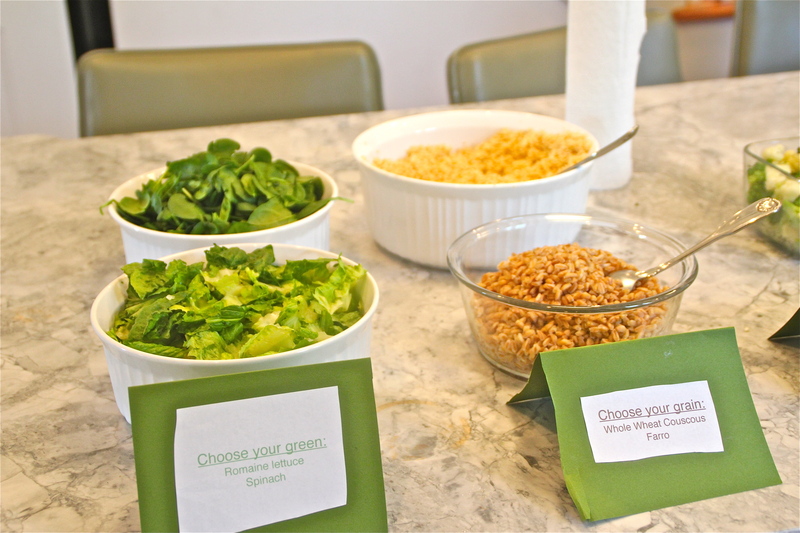 We did a “Build-your-own” Greens and Grains Veggie Bowl. Check out a few pictures from our day, and if you scroll through, you will see the actual menu further below. 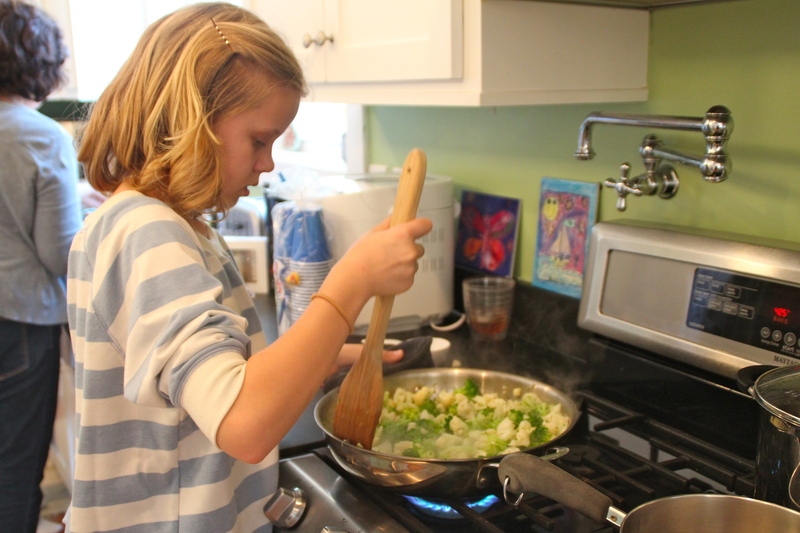 Cooking up some broccoli and cauliflower. 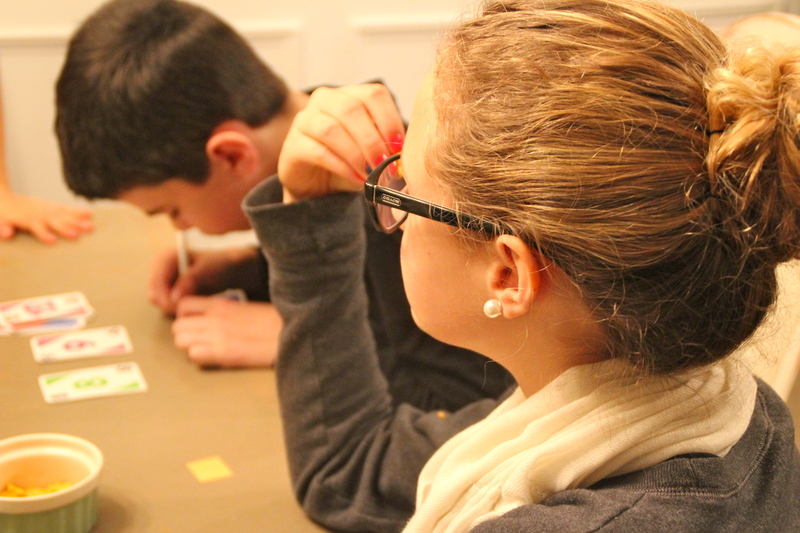 We try to get the kids to do as much as possible, although parents are around to help and guide if need be. My own little tall lady hard at work. 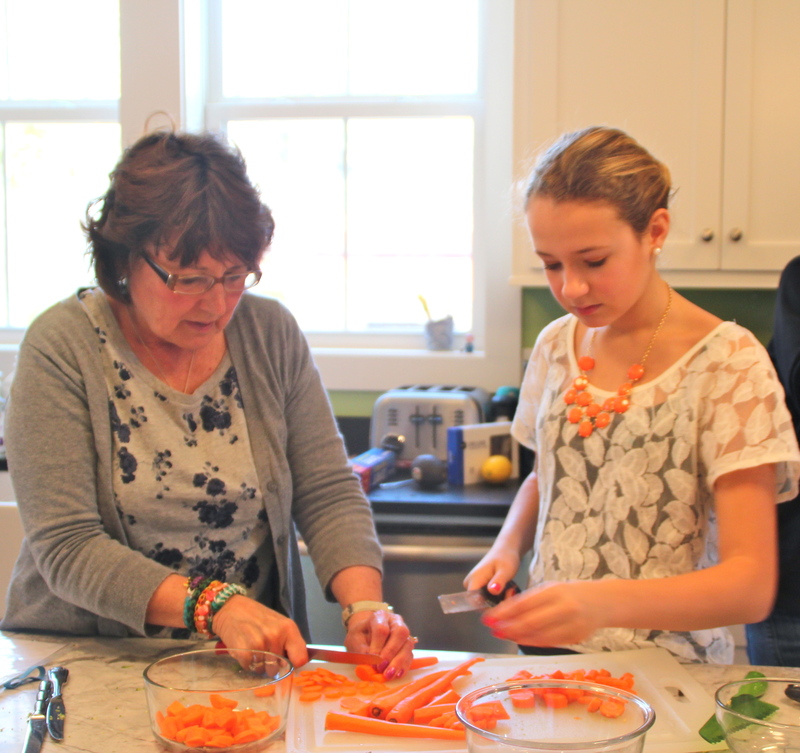 Older kids were assigned the more difficult cutting, like carrots, while the younger ones did the leafy greens. 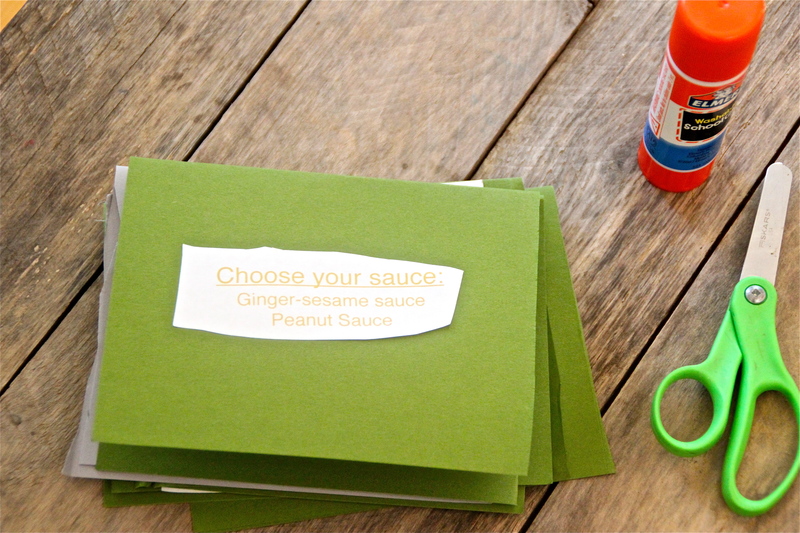 Measuring and whisking up the peanut sauce. This one was my fave! These were put together by the younger kids. There was a job for everyone. Really the possibilities are endless with this. 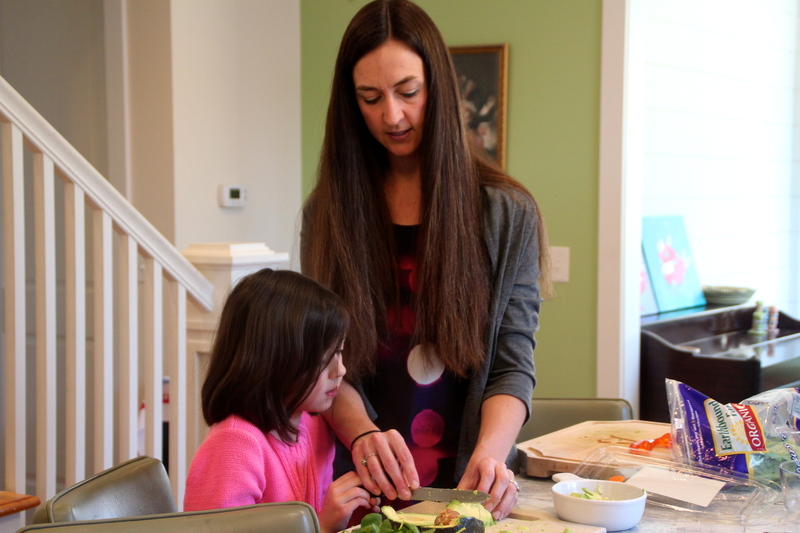 We limited the options so that parents didn’t have to take out a second mortgage to afford their ingredients. The crew. Ready to divide and conquer. Okay, so a couple of things on the pictures. There are not near as many as I would have liked for various reasons. 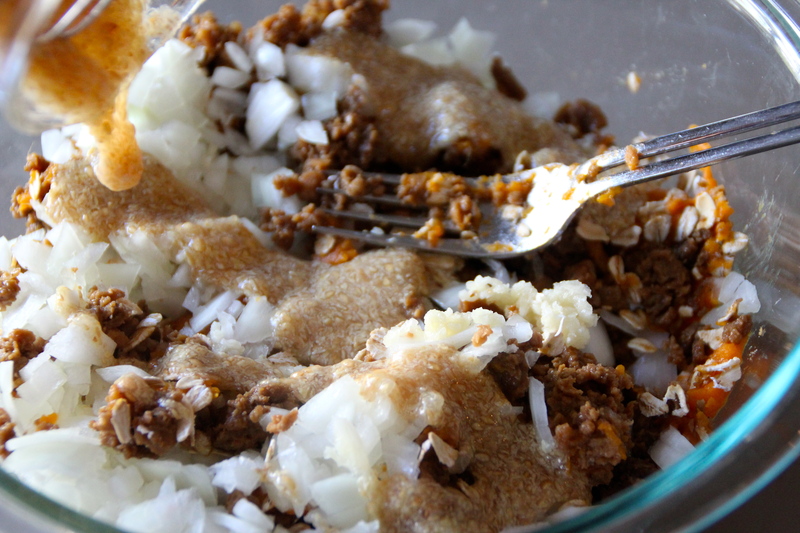 For example, I had to shoot home because I forgot to bring one crucial ingredient for one of our sauces, miso paste. Womp Womp…Also regarding the pictures. 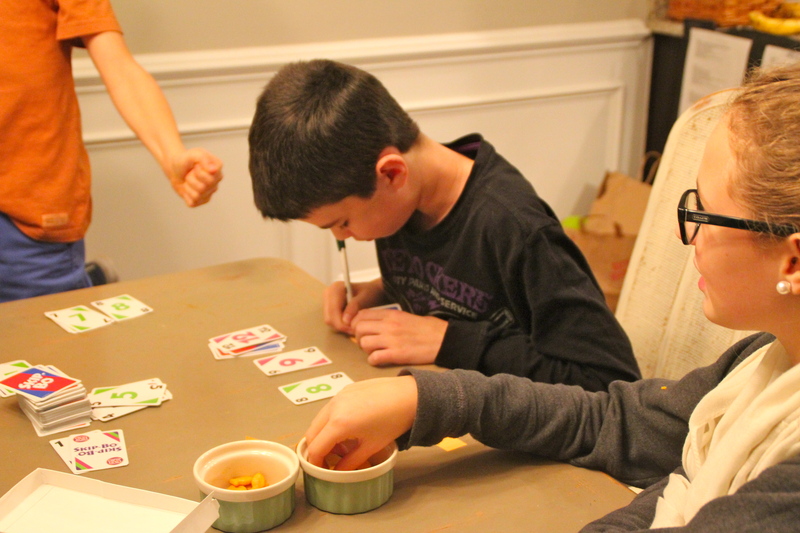 Although the boys do not appear to have helped at all in the prep, it’s because while I was home getting the miso, they had been there, done that. By the time I got back with the stuff they were way beyond their kitchen duties and practicing their zip-lining skills out back of the house. Another thing. 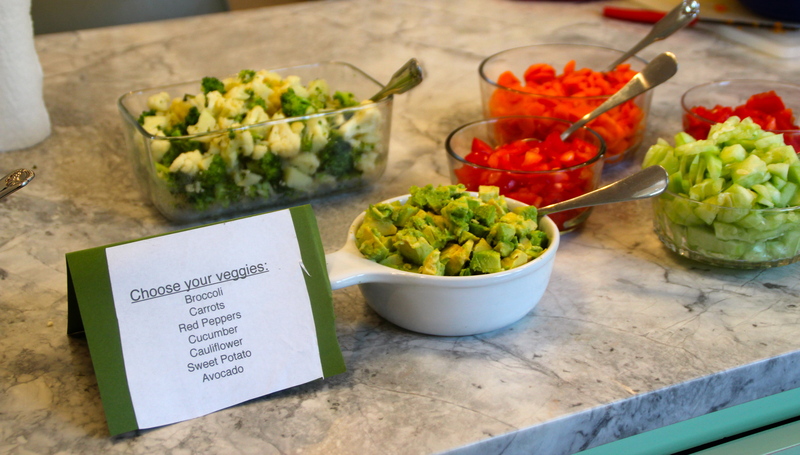 I kind of attacked the food when I got back so no end result Grains and Greens Veggie Bowl picture. Forgive me if I post our exact menu?? Pour 8 cups boiling water over eight tea bags in a heat-resistant container. 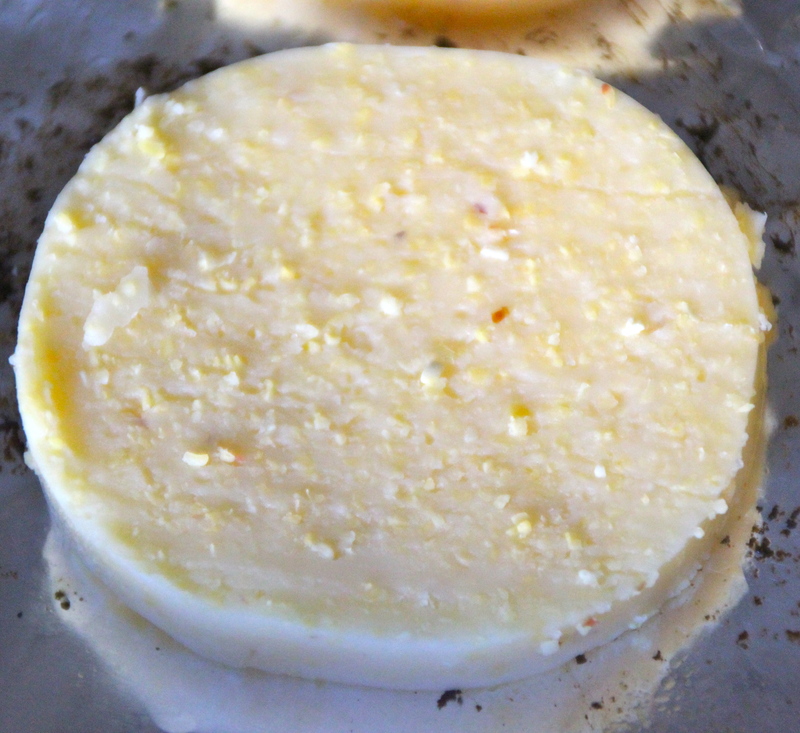 Steep 4 to 6 minutes and remove tea bags. If desired, add sweetener while tea is hot. Add 4 cups cold water and chill.